A strong business underlies a growing dividend. Software giant Microsoft (NASDAQ:MSFT) has done well for its investors. Over the last five years, the company's share price has nearly tripled, tacking on hundreds of billions of dollars to the company's market capitalization in that time. On top of that, Microsoft hasn't been stingy about sharing its business success with its shareholders -- the folks who, after all, own the company. As the company's market value has surged, the company's dividend has also risen significantly. Indeed, at the end of 2013, Microsoft's quarterly dividend was $0.28 per share. Today, it stands at $0.46 -- up 64% over the past five years. Although the information above strongly hints at it, I'd like to go over why Microsoft is a great dividend growth stock. A good dividend growth stock in my book is a company that consistently grows the size of the quarterly dividend that it pays out to its shareholders in a sustainable way. 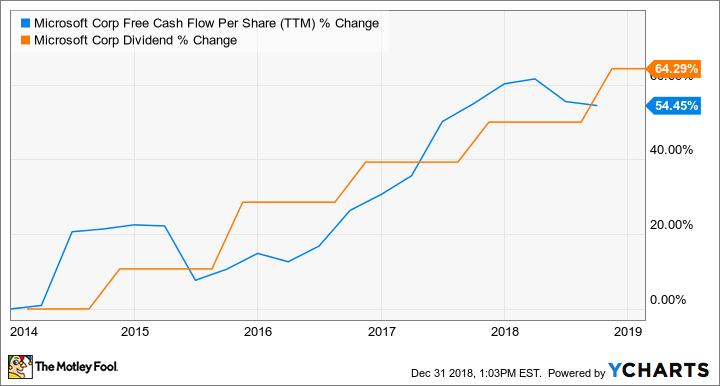 It'd be easy for a company to simply keep raising its dividend even in the face of flat-to-down financial performance by merely increasing the percentage of its free cash flow that it allocates to the dividend. Such a strategy might work for a little while, but without underlying business growth, a company could wind up paying out all of the free cash flow that it generates as a dividend. Then, at the first sign of business trouble, that company might be forced to cut its dividend payments. Microsoft doesn't overexert itself with its dividend. Over the last 12 months, the company raked in about $4.12 per share in free cash flow. The company's quarterly dividend of $0.46 -- which translates into $1.84 on an annual basis -- represents less than half of its trailing 12-month free cash flow. On top of that, both Microsoft's dividend and its free cash flow per share have been trending in the same general direction over time -- up. The software giant, however, is quite diversified and has exposure to a number of healthy market segments. For example, Microsoft is one of the top cloud computing vendors with its Azure Cloud platform; Azure Cloud revenues surged 76% year over year last quarter. The company is also dominant in the world of office productivity software; last quarter, Microsoft reported that its Office commercial products and cloud services revenue swelled 17% year over year, and their consumer counterparts enjoyed 16% sales growth. The point, though, is that Microsoft isn't a one-trick pony -- it has a lot going on, and it's in a strong position in just about every market segment in which it participates. That's a recipe for long-term business success that should keep the company's sales and profits growing for years to come, translating into dividend growth that investors can depend on.